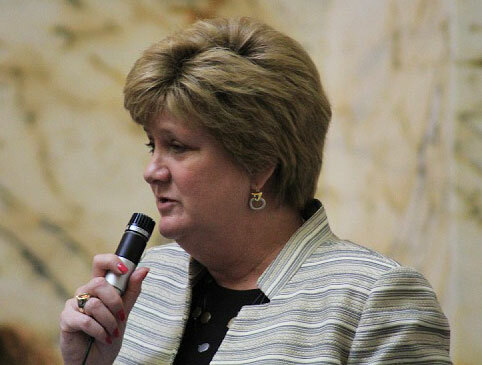 During floor debate over the state budget, the Maryland House of Delegates rejected an amendment that would restore $1.1 billion in funds that had been taken from highway user revenues to pay the state’s bills during budget shortfalls since 2003. Del. Susan Krebs, R- Carroll, who introduced the amendment, argued Wednesday that the state had an obligation to restore these highway revenues before asking motorists to pay additional tolls and gas taxes. The state has historically shared a portion of its transportation revenue, highway user funds, with local governments to pay for road projects. “We need to pay it back before we ask our motorists for another penny,” Krebs said. Minority Whip Jeannie Haddaway-Riccio, R-Talbot, agreed. “The money for the roads has already been paid, and now that it was taken, citizens should not be asked to pay again,” she said. Haddaway-Riccio said that her constituents feel burdened by the recent increases in bridge tolls and gas prices. She insisted that transportation funds should be spent exclusively on transportation projects, and argued that the redirection of those funds was illegitimate. “Maybe we should change the name of the Transportation Trust Fund, because if we are not going to use the money for transportation, it’s disingenuous to call it that,” Haddaway-Riccio said. Democratic delegates contested this analysis, saying that the taking of highway user revenues really amounted to a reduction in state grants for local roads. They argued that reducing local aid was appropriate, given the difficult economic conditions. St. Mary’s County Democrat John Bohanan Jr. said that Republicans were asking for the impossible. Del. Mike McDermott, R-Wicomico and Worcester, replied by saying that counties and cities were also suffering from the economic downturn, and he argued that these local governments would have to make painful sacrifices if their state transportation funding was not restored. Gov. Martin O’Malley’s administration’s position is that the state does not owe any money to the transportation trust fund, since it has repaid more than $500 million that was taken from the fund during the years when the governor declared a fiscal emergency. Highway user revenues are part of the trust fund but are kept in a separate account, and the O’Malley administration argues that the money removed from that account is not a debt. Krebs condemned the O’Malley administration’s position, arguing that it was hard to justify taking a billion dollars with no intention of returning it. “I understand why the state spent that money during a fiscal emergency, but I don’t think anybody agreed that we wouldn’t be paying that money back,” she said. According to an analysis by the legislature’s staff (page 31), $245 million of the $1.1 billion transferred out of the Highway Users Revenues to the general fund was removed during the administration of Republican Gov. Bob Ehrlich. None of that money was replaced, nor was the $868 million taken during the O’Malley administration. ← Mikky Ekko: Who is he?